It has been five years since I first made this post and I am happy to add this update that my friend Sam is still here and still going strong. HAPPY BIRTHDAY Sam!!! Sam is now 94 and doing well. I am running a little late with this post with the busy Christmas season but it is still not too late to post a birthday tribute to my good friend and fishing partner; Sam. On December 22 Sam turned 94 years young. Sam is no longer chasing the bass but he is healthy and doing well. From here forward in this post is what I wrote in 1997 and I am leaving it the same. 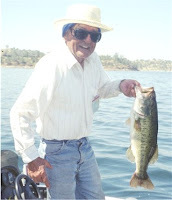 At age 88 Sam's love for bass fishing is still matched by his energy to pursue them. Guess what he did to celebrate his 88th birthday; you guessed it , he went fishing as he does almost everyday of the week summer and winter. Sam has the same love of top water fishing for bass that I do; but still keeps up the chase all winter long. I have posted a picture of Sam with a nice bass he caught last summer using his favorite top water lure; Sam's Favorite. 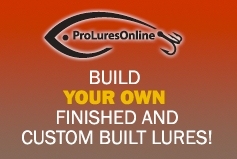 This is one of the lures I make and Sam liked it so much I named it after him. It has the age old popping sound and action and just like Sam; it still catches bass.